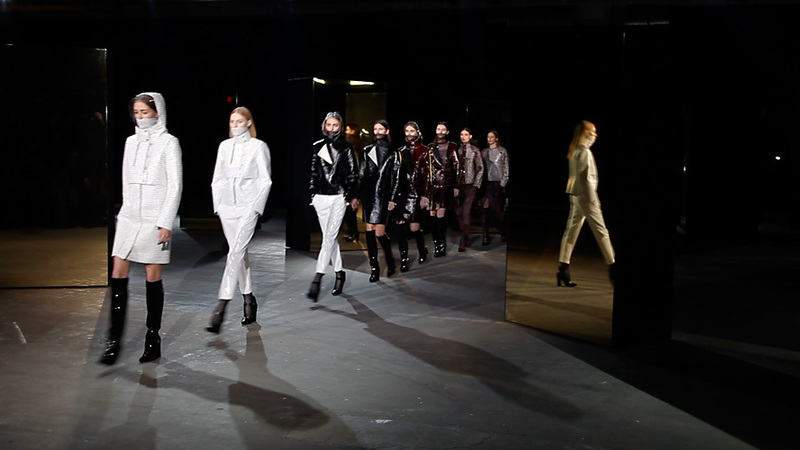 For this collection Alexander Wang was interested in exploring the idea of covering up, lamination and lacquering. Tweed coats, hooded jacked and even wool sweaters were lacquered, and suede pants and coats came with waxed panels. Exploring this idea with mix of materials, there were also turtlenecks made of fishnet and puffer vests in black leather. Mid-calf skirts with slits and slim-fit pants accented the sharp tailoring, which was all the more fitting for supermodel Gisele Bündchen, who made a surprise walk down the runway.